At least 13 people have been injured, six of them in critical condition, after an explosion took place outside a court house in the northeastern Ukrainian city of Kharkov, local police reported. “All the wounds were caused by metal fragments,” he added. According to preliminary information, the explosion went off at the end a hearing regarding the case of a member of the nationalist Svoboda party. The member had been accused of bringing a weapon to a polling station during the parliamentary election on October 26. Several party members supported the defendant during the hearing, with the blast occurring right after they left the court building, Geraschenko said. The explosion in front of the court house has been qualified as a terrorist act, the Ukrainian Interior Ministry said, adding that “an investigative team, comprised of representatives of the police, the Prosecutor General’s Office and Security Service of Ukraine (SBU)” had been working on site. According to preliminary data, the blast was caused by an exploding grenade, the Ministry told TASS news agency. Svoboda played an important role in the Euromaidan protests, with 18 of its members killed during violence in Kiev last February. After the ousting of Ukrainian president, Viktor Yanukovich, three Svoboda representatives made it into the new government, occupying positions of deputy PM, agriculture and environment ministers. But the far-right party failed at the parliamentary election, losing 31 of out of the 37 seats in the Verkhovna Rada. 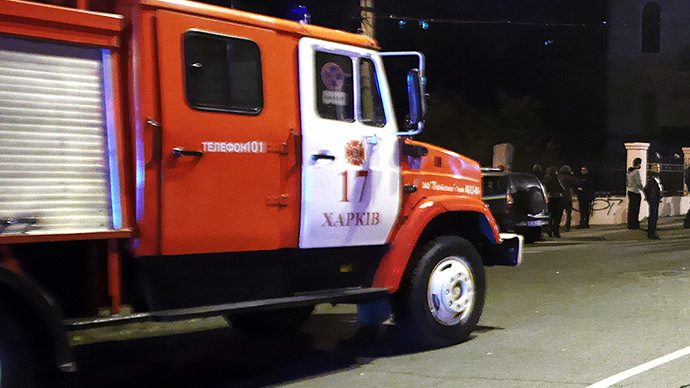 In the past few months, Kharkov has borne witness to several explosions. On December 25, a furniture shop belonging to a pro-Kiev activist, was blown up. In early December, a blast went off late at night at the gates of a military unit stationed in Ukraine’s second-largest city. There were three explosions in the city last November, including a blast at a popular music venue and pub called Stena, which injured 13 people. Members of the volunteer battalions, taking part in Kiev’s military operation in south-eastern Ukraine, were known to gather there. The Ukrainian military launched an operation in the country’s southeast last April, after the Donetsk and Lugansk regions became the site of a rebel movement refusing to recognize the new, coup-imposed authorities in Kiev. The death toll in the Ukrainian conflict has exceeded 4,800. Over 10,000 have been injured, according to UN estimations.